The development of technologies for autonomous driving is currently the hottest topic in the automotive industry. Billions of dollars and Euros are being spent to develop a new generation of sensors and technologies that collect, process, correlate and analyze sensor data of different types. Recent autonomous driving systems shown at CES 2019  are equipped with four short-wave LIDARs, five long-wave LIDARs, six electronically scanning radars (ESR), four short-range radars, a trifocal camera, one traffic light camera and other sensors. Even without LIDAR sensors, a typical test vehicle with current video and RADAR sensors produces up to 30 TB of raw data per day. This causes challenges for typical data center infrastructure due to the incredible amount of data. Considering a fleet of 10 test cars, that operate about 200 days a year, the amount of 60 PB of data being generated needs to be stored, processed and managed. Scale-out file systems like Qumulo can help to address these challenges with a very modern filesystem that scales to many petabytes. It runs on standard x64 hardware platforms from different vendors and in the cloud, it is very easy to manage, and can be integrated into any automation environment due to its complete API functionality. Data ingest is global. Due to the amount of data being collected in test vehicles, it cannot be uploaded online to a company’s data center. Instead, data needs to be uploaded to the storage system locally when the car is “at home.” Typically test cars drive in all regions of the world, which means data will be ingested to a central system from all parts of the world. Data access is global. There are several steps in data processing that also happen from multiple regions. For example, data annotation is, to a large extent, a manual process. People from all over the world are performing this; at least the portion of data being used as training data for ML algorithms must be annotated or validated by humans. Data access must be fast. Several process steps require low-latency access to data such as video processing, object recognition, and machine learning. High bandwidth access. HIL (hardware in the loop) and SIL (software in the loop) testing require very high throughput. Typically many streams are read in parallel to reduce simulation times. Consider, for example, that 80 parallel streams of video data with 400 MB/s per stream requires 32 GB/s throughput from the storage system. These requirements are contradictory to some degree. 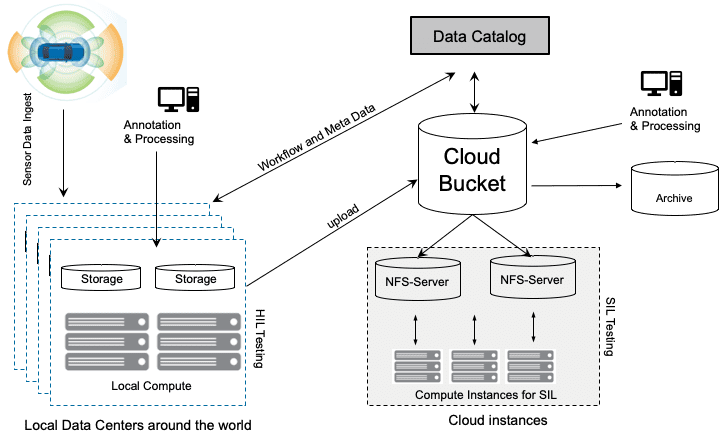 While for global ingest and access, object storage in the cloud seems to be the ideal solution, fast and high bandwidth access are attributes provided by local file system storage. And while SIL simulations can run completely in the cloud, HIL requires that physical devices und test (so the video cameras, LIDAR and RADAR sensors for example) be present in the validation. These devices cannot be “placed” in the cloud, obviously, and need to access local data with high throughput. At the same time, HIL and SIL applications typically require a file system for data access. For that reason I have seen companies running a hybrid approach where data is ingested and pre-processed in local data centers and then uploaded to the cloud where it’s centrally stored and indexed (see Figure 1). There are some disadvantages with this approach. The local file storage is typically historically grown and not made to handle the volume of data, nor is it well-suited to exchange data with the cloud. APIs for management don’t exist, or are completely different to the cloud instances. Qumulo is the most modern file system on the market. It can spawn many nodes, it can be deployed on various hardware platforms, and it can also run in the cloud. System management, APIs and access protocols are 100 percent similar on-premise and in the cloud. Qumulo provides Terraform and Cloud Formation scripts (AWS) so that a scale-out file system cluster in the cloud can be deployed in minutes. Qumulo also provides all the enterprise features in the cloud that users expect from modern systems: multi-protocol access (NFS, SMB, FTP, HTTP), multi-site replication, snapshots, quotas, analytic capabilities for monitoring and planning, and others. Figure 2 illustrates such a hybrid implementation for ADAS development and HIL/SIL simulation in an AWS environment. The Media Asset Management catalog system can access Qumulo via rich APIs for management, and automation of even data access. The management of a Qumulo instance is similar on-premises and in the cloud. This lowers administration costs compared to scenarios where different solutions are deployed on-premises or in the cloud. Qumulo file systems grow on demand, whether you add a physical node on-premises or another compute instance in the cloud. In both cases, capacity and performance scale up linearly. Applications don’t need to be rewritten when they run in the cloud because Qumulo provides the same multi-protocol access in both environments. 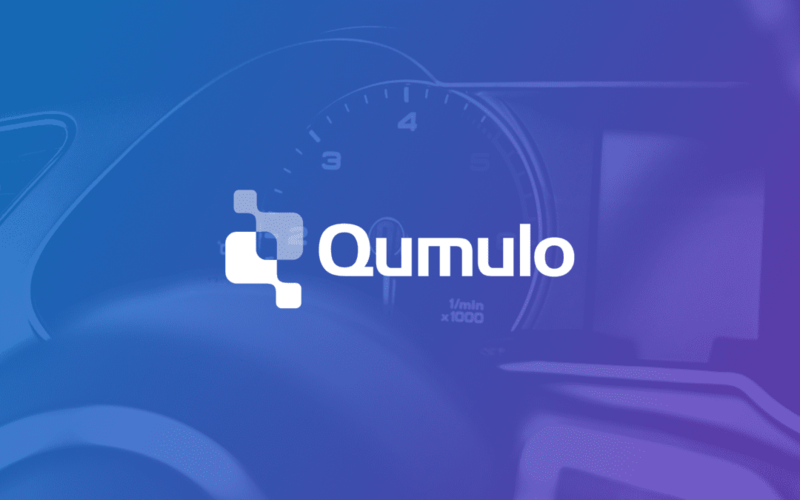 To see how automotive companies use Qumulo for ADAS development, read our case study from Hyundai Mobis. Stefan Radtke has spent his career working in technology, and comes to Qumulo as a principal evangelist of universal-scale storage for EMEA. 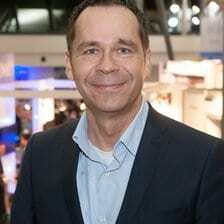 Most recently, Stefan has been working to bring the best storage solutions to the automotive industry.